Sal Bar & Brassiere in Llandeilo has a function room that can be booked. The pub has an outside area, it has live music events. Sal Bar & Brassiere has a pool table. The pub shows football on TV, it has terrestrial TV. 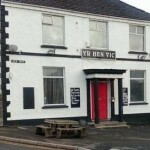 Yr Hen Vic in Llandeilo has a beer garden. The pub has a car park, it is a family friendly pub. Yr Hen Vic serves food. The pub has a smoking area. White Hart in Llandeilo has accommodation. The pub has a function room that can be booked, it has a dart board. White Hart has live music events. The pub has a pool table, it holds quiz nights. White Hart shows football on TV. The pub has terrestrial TV. Torbay Inn in Ffairfach shows football on TV. The pub has Sky Sports, it has terrestrial TV.